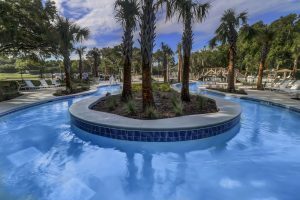 Hilton Head Plantation is Hilton Head Island’s second largest plantation and it’s most densely continuously populated community. The mostly residential community provides a diverse offering of charming low-maintenance homes, luxurious estates, resort-like villas, and homesites of every size and views imaginable. The community is bordered by the Intracoastal Waterway and Port Royal Sound. Hilton Head Plantation’s ten thousand permanent residents enjoy access to an abundance of outstanding amenities located within the gates of the plantation’s four thousand acres including four championship-grade golf courses, twelve tennis courts, two bocce ball courts, three shuffleboard courts and seven miles of winding bike and leisure trails. 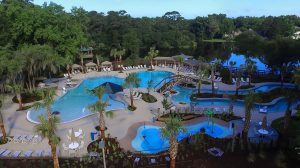 Home to the Country Club of Hilton Head, Hilton Head Plantation also offers two miles of sandy beach along the shores of Port Royal Sound, two nature conservancies, numerous parks and pavilions, Skull Creek Marina and the popular Old Fort Pub restaurant. The latest addition to HHP is the Spring Lake Recreation Area (pictured above). Spring Lake consists of a fabulous new water attraction for the whole family including a lazy river, zero-entry, splash pad, cabanas, bathhouses, and swim laps. The recreation area includes a beautiful new two-story Pavilion, firepit, ball fields, walking trails, fishing areas, a playground, 12 Har-tru tennis courts and Pro Shop. Click for a complete list of Private Schools on Hilton Head.